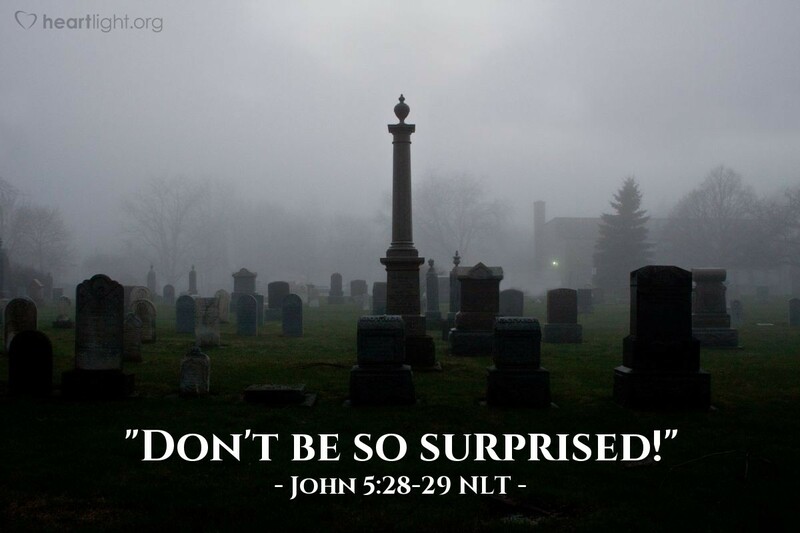 [Jesus said,] "Don't be so surprised! Indeed, the time is coming when all the dead in their graves will hear the voice of God's Son, and they will rise again. Those who have done good will rise to experience eternal life, and those who have continued in evil will rise to experience judgment." Do you remember the voice of your mother or father calling you home? I do. Of course, my perception of that voice was greatly influenced by what I was doing and whether that was pleasing to my mother or father. For those of us who have lived for Christ, hearing the voice of our Savior and being raised from the dead will be glorious! His voice will be powerful, majestic, and exciting. However, for those who have not lived for Jesus, who have done what is evil and not come to him for grace and salvation, his voice will be mighty and terrifying. Let's make sure that our love for the Lord ensures that whether we are alive or dead when he comes, the sound of his voice will thrill us with the anticipation of our eternal glory! Father, shape my life into the character of your Son. Empower me toward holiness by your Holy Spirit as I seek to honor you with both my heart and my behavior. Forgive me for not being more passionate about my life being lived for your glory. Fill me with expectation as I await the sound of my Savior's voice at his glorious return. In Jesus' name. Amen.